You are about to read the story of a young black man from Okolona, Mississippi, who was kicked out of college for protesting against racial discrimination at Mississippi’s flagship university. This journey shows Ole Miss as it was during the 1960s after it was forcibly integrated in a violent struggle that resulted in two people being killed, and it also shows how years after Ole Miss was desegregated, blacks were still not allowed to be on the faculty, barred from participation in sports, and subjected to harassment and discrimination by the faculty and students. This narrative also chronicles the typical life for blacks in Mississippi during the civil rights era from the 1950s to the 1970s. I was one of eight black students who was kicked out of Ole Miss in 1970 for “disorderly conduct” because I stood up and fought against racism. All eight of our lives were affected in different ways, but for most of us we were able to pick up the pieces and make something positive out of a bad situation. For me, I was an honor student at Ole Miss and had already decided to pursue law as a profession even before I enrolled at Ole Miss. 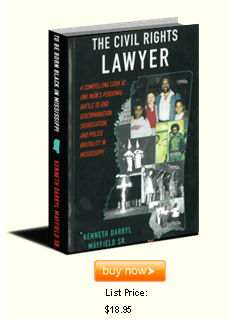 My experiences at Ole Miss prompted me to become a civil rights attorney in order to fight against racial discrimination and injustices in Mississippi. Ole Miss is located about an hour’s drive from Okolona, but this was not the reason I wanted to attend. Nor did I attend because I was a radical or wanted to break down barriers of discrimination. I chose to attend Ole Miss in order to get a good education from Mississippi’s finest university in hopes of becoming an affluent lawyer who would spend his good life in California, but my journey ended quite differently. I got caught up in the struggle during my second year of college, and before I knew it, I was a black militant whose mission was to end racial discrimination at Ole Miss by any means necessary. As a black militant, I burned every Confederate flag I could get my hands on and even attempted to burn buildings. 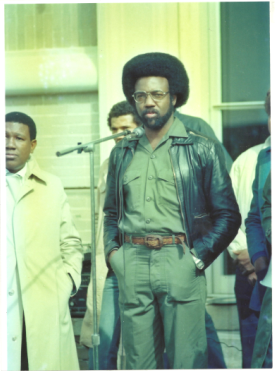 I was a bona fide black militant, was proud of my militancy, and to make sure that everyone knew, I always wore an African dashiki, combat boots, dark shades, and a black beret. As a black militant at Ole Miss, I now confess that I was full of rage and anger and committed acts that were serious, dangerous, and even unlawful. I was angry with Ole Miss, the State of Mississippi, the United States of America, and even God. As of this writing, it has been over forty-one years since I attended Ole Miss, but, in spite of the passage of time, I realize that there are some persons who would still like to see me and others prosecuted for crossing the line when we were teenagers. Therefore, in order to avoid self-incrimination and protect my friends, I have altered certain facts and characters in Chapter 6. 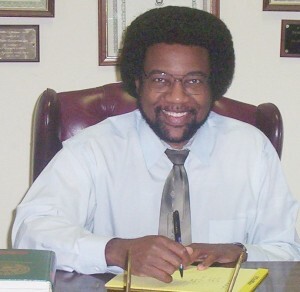 In the fall of 1970, after we were thrown out of Ole Miss, I enrolled at Tougaloo College near Jackson, Mississippi, where I graduated as an honor student in 1971. After college I enrolled in the expedited law school program at the University of Michigan Law School and graduated from there in two years at the age of twenty-two. Immediately after graduation from law school, I returned to Mississippi to re-engage in the civil rights struggle with plans of engaging in civil rights for two years. When I returned to Mississippi to practice civil rights, the rage and anger I experienced at Ole Miss was re-ignited; however, I decided that I was going to do everything according to the law. This was after the passage of the Civil Rights Act of 1964 barring employment discrimination, the Civil Voting Rights Act of 1965, which prohibited discrimination in voting, and the Housing Acting of 1968, which prohibited discrimination in housing, yet Mississippi was still trying to hold on to its past racist ways. I was prepared to sue anybody or any institution that discriminated against or mistreated blacks. The first lawsuit I filed was against the owner of an office building on Main Street in Tupelo, Mississippi, where I eventually located my office. Fear was not a factor with me. I was like a patriotic soldier who was willing to put his life on the line for the greater good. The Mayfield Law Firm hosted its 2011 Annual Charity Ball on Saturday, December 17, 2011, 7pm at the Summit Center, North Gloster Street, Tupelo, MS. Over 250 patrons supported this event. 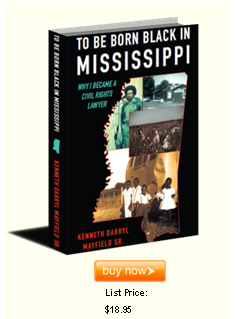 I had a book signing for my first book titled "To Be Born Black in Mississippi. This book can be purchased online at www.kennethmayfield.com. I have completed my autobiography (the young years) titled "To Be Born Black in Mississippi". It will be published in October. I'm hopeful it will be million dollar seller.